Koyodai (紅葉台) is the best spot of Mt. 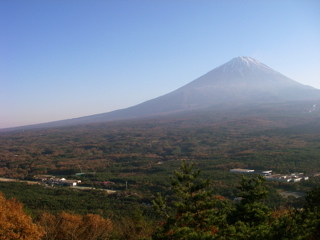 Fuji located at the small mountain north of Mt. Fuji. There is a 360 degree panorama view tower which you can see Mt. Fuji, Fuji Forest, and all of Fuji Five Lakes. In autumn, entire Fuji Forest become a great autumn colors. Koyodai was chosen the best 150 spot of autumn colors in Japan. You can drive up to the view tower, but its a great mountain for hiking. Koyodai is the best spot of Mt. Fuji located at the small mountain north of Mt. Fuji. There is a 360 degree panorama view tower which you can see Mt. Fuji, Fuji Forest, and all of Fuji Five Lakes. In autumn, entire Fuji Forest become a great autumn colors. Koyodai was chosen the best 150 spot of autumn colors in Japan. You can drive up to the view tower, but its a great mountain for hiking. There is an observation tower where also you can eat, drink and buy a souvenir. The tower has a parking space, but the road is not good condition and many hikers are walking. There is a parking at lower position, so park there and hike to the tower. It will take 15 min. to get to the tower. There is a stable at the lower parking, so you can ride horse to visit the tower.